Despite the fact that cowboy boots have become somewhat of a trend, they serve an actual purpose. While you’re trying to fulfill your responsibilities, there is little that is more annoying than slipping socks that just don’t feel right in your boots. So it’s worth taking your time to search and find the best socks for cowboy boots. The first thing to know when looking for the best socks for cowboy boots is that socks are not all created equal. This may seem like common knowledge, but the fact is, when the moment strikes each day, it’s easier to put on the first pair of socks you find than to spend time looking for an appropriate pair for your needs. Material: your best choice throughout the year, is wool. These socks will keep your feet warm in cold weather and cool in hot weather. Your feet may get sweaty after a day spent in your cowboy boots, and wool socks will help to absorb and release moisture to avoid odor and irritation. Quality: if you’re someone who works outside in their cowboy boots all day, then you know the importance of keeping your feet comfortable. You want to choose and invest in good quality socks that will be able to withstand the wear and tear of long workdays. Handmade socks are always best. Sock Type: this comes down to the choice you make each morning to get dressed quickly or properly. Do not wear a pair of dress socks with your cowboy boots. That is setting you up for a lot of discomforts. Your best bet for cowboy boot socks is athletic styles, or protective socks if you have specific feet or leg issues. 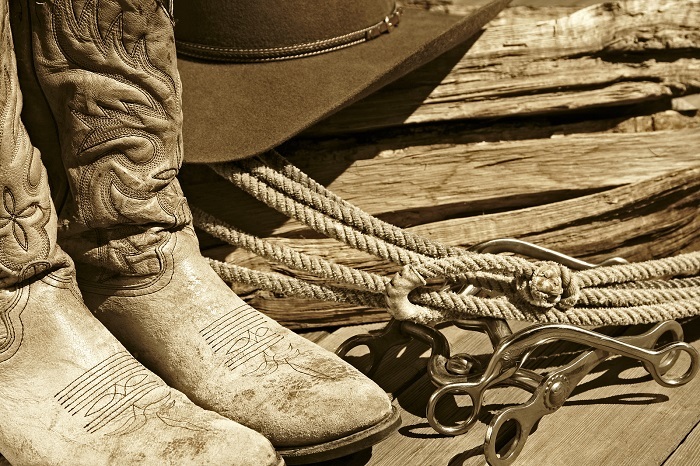 Knowing which socks to put under your cowboy boots can enhance the quality of all your days. There is no harder undertaking than finding men’s boot socks that stay up. Whether it’s due to sweat, looseness, or anything else, it seems like socks are always sliding down in cowboy boots. When you’re in the middle of doing work, that is something you don’t want to have to deal with. That’s where sock length comes in. Logic may try to lead you down the path of choosing short socks because you think to yourself that would quickly solve the problem of slipping socks, but think again. The shorter styles of socks aren’t ideal for boots because it leaves the rest of your leg open to rubbing against the boot and getting irritated, and you might simply feel cold. Choosing socks that go over the calf is the smartest way to go when it comes to your cowboy boots. This style is sure to keep you warm when it’s cold outside, and overall, will protect against and chaffing that may occur from a lot of movement. Wrangler is a brand that is well-known for providing quality products, and the boot socks are no exception. Made from 80% polyester, these boot socks are designed with moisture-wicking abilities to keep your feet dry and cool no matter how long you’re working or how hot it is. These socks are affordable and easy to upkeep, as they can be machine-washed. The over-the-calf design will create optimal comfort in your cowboy boots, so you don’t need to worry about your skin chaffing against your boots. If you’re looking for sturdy, everyday boot socks that won’t slide down, these Wrangler socks are a great choice. Click here to view Wrangler Western Boots Socks on Amazon. Another pair of over-the-calf socks for the ultimate comfort in your cowboy boots, these Galiva socks are made from 80% cotton. That means that you will feel like your feet can breathe while wearing these socks, even on hot days. Since these socks are pre-shrunk cotton, you will know exactly how they fit for the first time and be able to wash them daily without damaging the quality. If you like your socks to fit snugly, then you will appreciate Galiva for their product, which will hug your legs without cutting off your circulation. Made with wool, Hi-Tec gives you socks that provide compression that will keep your legs and feet supported and comfortable throughout even the longest day of work and physical activity. The more than reasonable price is likely to make you a repeat customer. These socks come up over your calf and will not slip down during your day no matter how you move your feet. While you can wear these socks in any weather, you may find that your feet get a bit hot during the warmer months, although you will be kept very warm when it’s cold. Click here to see the pricing for the Hi-Tech Cowboy Boots on Amazon. Made specifically for use with cowboy boots, Dan Post men’s socks are the ideal over-the-calf cotton socks to wear during your long work day. The price is affordable, and the white look of the socks is simple and neat. These socks are manufactured in the United States by people who know what it’s like to wear cowboy boots during long days. Even if you sweat, your feet will be left feeling cool and dry while wearing these socks, and your sweat will not seep into your boots and ruin their lining. If you’re looking for a company that means business and provides true convenience, look no further. When you buy your socks from Pure Athlete, they give you a lifetime guarantee, which means that at any point, when your socks get worn out, you can simply send them back and have them replaced. The moisture-wicking ability of these socks will keep your feet dry no matter how much you sweat. You will stay warm as well, but your feet won’t overheat! Click here to read reviews posted about Pure Athlete Work Boot Socks on Amazon. It’s time to change the quality of your days. No more reaching for any pair of socks in your drawer. Invest in socks that are meant to work well in combination with your cowboy boots, and your feet will thank you.